When I look back to a few grainy photos taken in June 2006, a month or so after we moved here, it was kind of shocking to see how much we had achieved. The cabin sat rather forlornly like a brown carbuncle on the side of a steep hill accessed by a zig-zag path eroded by heavy rains. Exposed to the elements, there was no planting to shield us from prying eyes, and it was extremely difficult to walk the land because of the gradient. 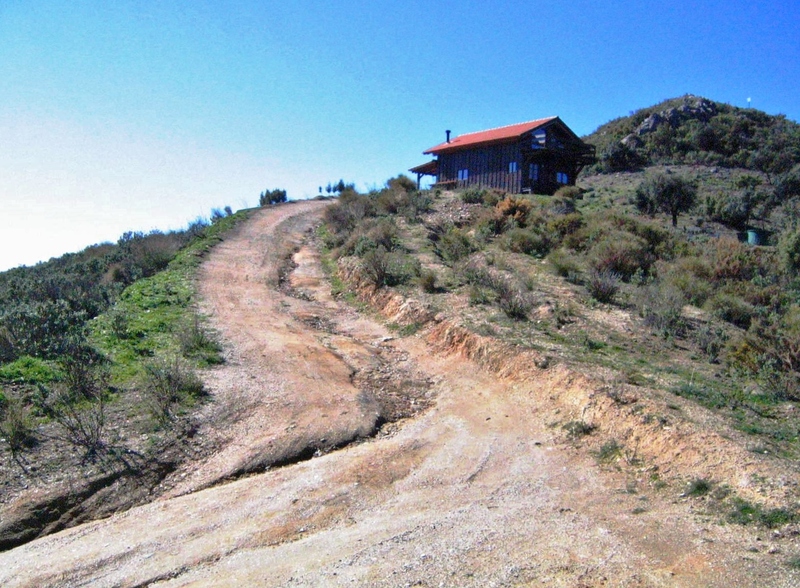 In those days we were convinced we had a rather unique property which would be absolutely ideal for rural tourism. In a truly magnificent setting with 360 deg panoramic views, we are surrounded by Parque Natural and all the associated and abundant wildlife. Its appeal would not be confined to hikers and nature lovers but perhaps we could also attract those interested in seeing how in principle (with a bit of tweaking) alternative energy works. Joe planned a number of significant terraces to each side of the house (the Mediterranean side and the wooded mountain side) and what could be more ideal than putting three or so little log cabins on the newly-excavated terraces? 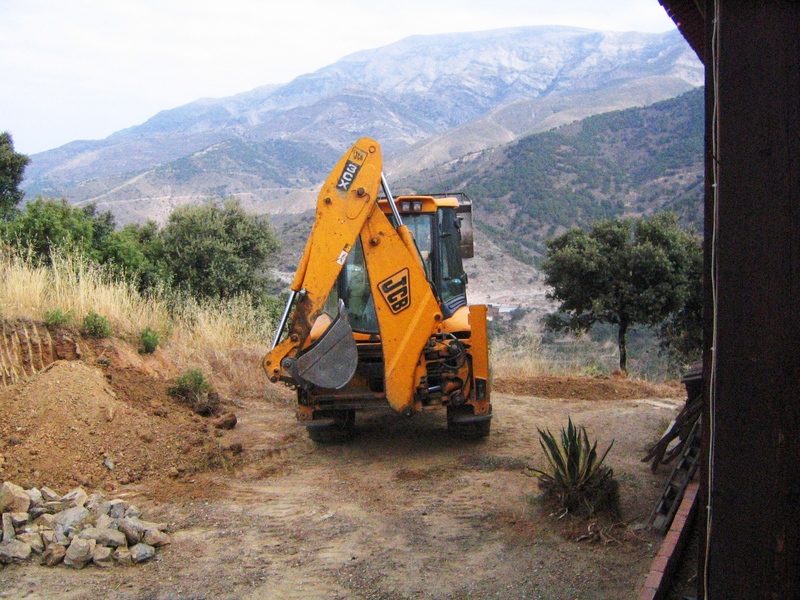 Over the years we’ve gradually carved out a network of paths and terraces but back then, in just a few short days Luis and his digger had made quite a difference, so much so that we began visualising where the cabins would actually go. We researched, worked on costings, studied the Junta de Andalucia’s mission statement for rural tourism, drew up plans and wrote a comprehensive proposal in Spanish. We were so naive in those days and still believed that we owned half of the hill behind us as shown on the title deeds, plans and register, why wouldn’t we? Also, and more importantly, our documentation proved that we had the necessary permisos (permission) to build a house anywhere on the land, and the architect’s plans were stamped and signed. We would live in the cabin until we’d finished building our dream house and then we would rent the cabin out too. Unfortunately it all came to nought as we had several meetings with the alcalde (mayor) and failed miserably to speak to anyone in the Junta’s HQ in Malaga who was a decision-maker. We were met by a conspiracy of silence which continues to this day. I think it was slowly beginning to dawn on us that our vision wasn’t their vision. An unfortunate case of being hung out to dry? However, we’ve noticed in the last few weeks that the Junta has been quite proactive in something tourist-related. These bollards have sprung up on the side of the tracks all around us and there must be at least a dozen of the blighters on a 2 km stretch of track. 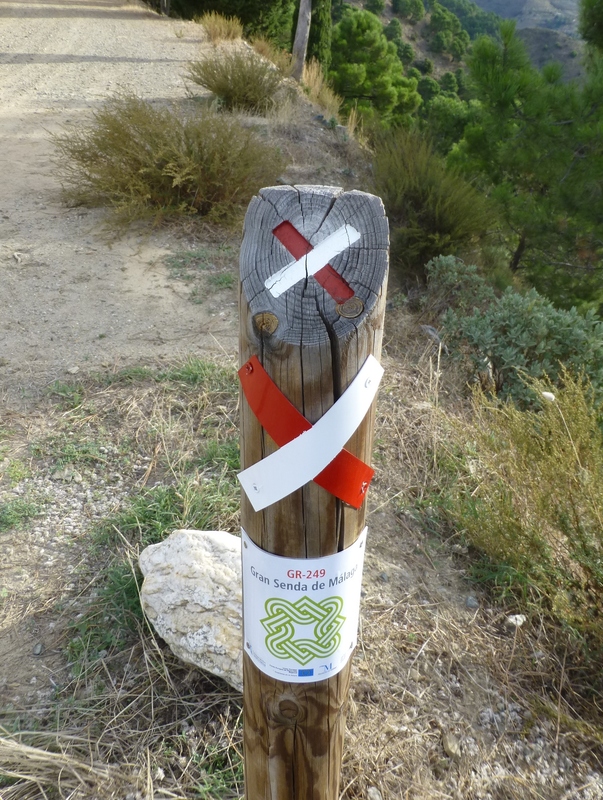 We finally worked out the complex code: one red and one white horizontal stripe means ‘go this way’, and if they’re crossed says ‘don’t go this way’ (far more of these than the ‘go’ ones!). 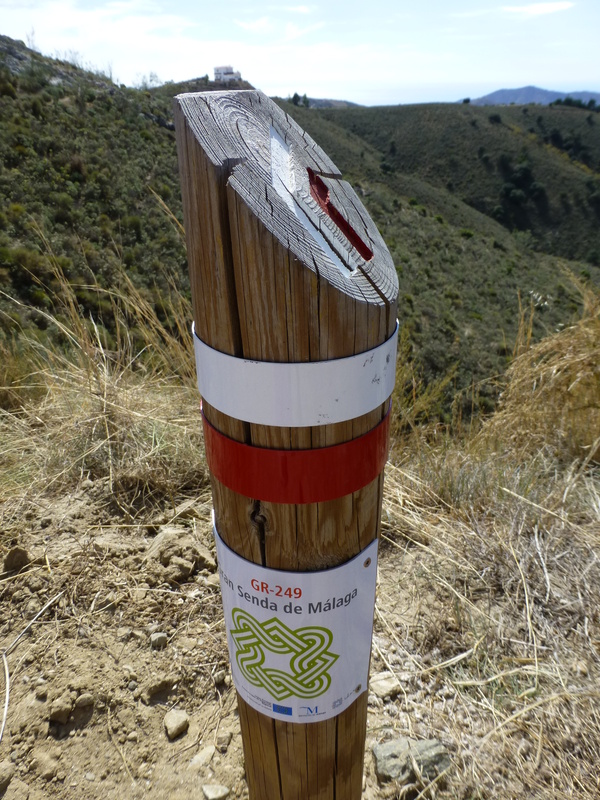 They have ‘Gran Senda de Malaga’ written on them with a number, which is presumably a newly devised hiking route. “A study has shown that three and a half million people are on the poverty threshold, some 40% of the population. 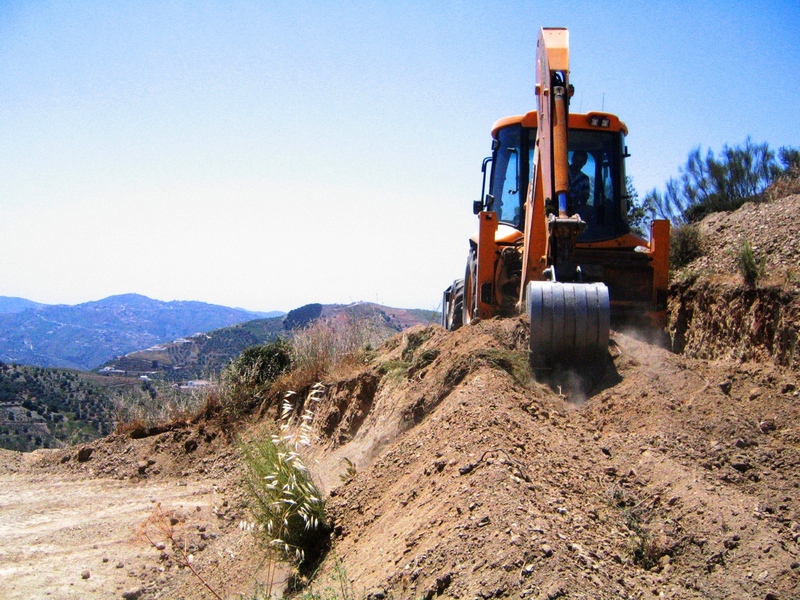 The region has gone from fifth on the list to the top in just one year according to the latest report from the ‘Andalucía Network for the fight against Poverty and Social Exclusion’. It says that one in four people in Spain are from Andalucía and the Andaluces can not meet unexpected costs. 66% of the schoolchildren in the region are lacking the means to buy education material” (from an article in ‘Typically Spanish’: “Andalucia is the poorest region in Spain”, 19 October 2013). 1 Response to Hung out to dry? What rotters those junta chaps really are! I bet they wouldn’t have had so many problems getting planning permission etc as the Brits would. Or is this just paranoia?